Christmas in London is a magical affair. As soon as the lights twinkle to life above Oxford Street, the mulled wine begins flowing and the carols start chiming. That’s when the festive season has officially begun. But it can be easy to miss it all by getting carried away with Christmas shopping, office parties and huddling inside trying to stay warm. It would be a mistake to let the Christmas season pass you by, though. London has so many magical things to offer during this time that it’s worth making the most of it all. So throw on a scarf, pop some carols on and check out some of my favourite attractions to make sure you have the most magical Christmas in London. Harry Potter fans will love the Warner Brothers Studio Tour at any time of the year, but at Christmas, when the spectacular Hogwarts in the Snow event is on, it’s an absolute must. The enormous studios, where much of the Harry Potter series was filmed, is decked out in Christmas decorations and snow, making it even more magical than usual. The Great Hall is laid out ready for a lavish Christmas dinner, the elaborate Hogwarts full-scale model is dusted in snow and when you step out onto Privet Drive you may just be treated to a snowstorm as you sip some delicious butterbeer. Book your tickets to Hogwarts in the Snow here. Winter Wonderland is something of an institution in London, with locals and tourists flocking there year after year to get into the festive spirit. Located in Hyde Park, this Christmas attraction is part amusement park, part food festival and part German market. 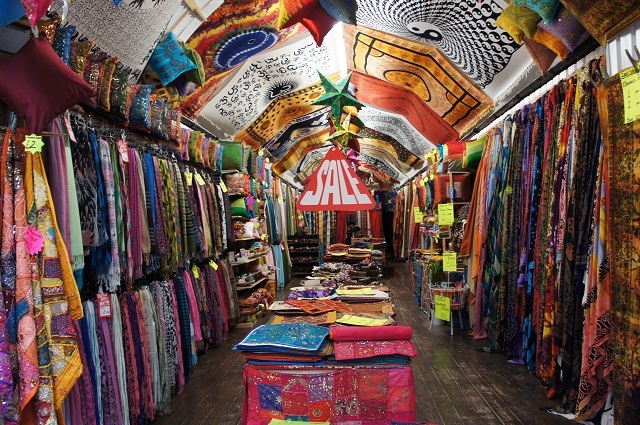 There are ice sculptures, a skating rink, Santa’s grotto and even circus shows to keep visitors entertained. It’s the perfect place for a romantic date or a night out with friends, and there’s no way you can leave without feeling Christmassy. Entry is free, although most of the attractions aren’t, and it’s best to purchase tickets for these in advance. Insider’s tip: Get cash out before you go. Cards aren’t widely accepted and the on-site cash machines charge a fortune for each withdrawal. Can’t make it to Europe for quaint Christmas markets? No problem. Just head to London’s buzzy Southbank area for a taste of the real thing. Wooden chalets await, filled with warm treats like mulled wine, and handmade goodies for you to wrap up and put under the Christmas tree. And all with a view over the Thames to the London Eye, Big Ben and beyond. The Southbank Winter Market is a classic Christmas treat in the heart of London. 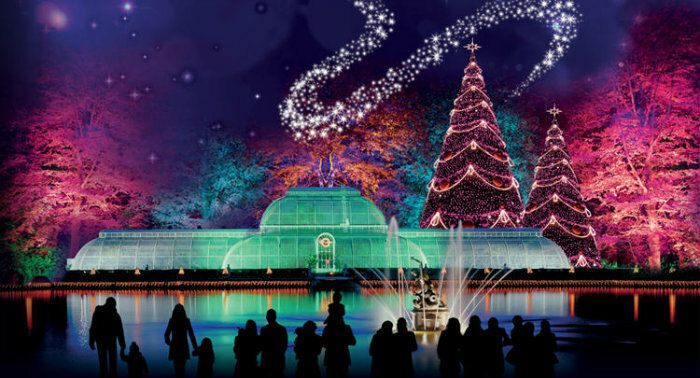 Famous for being the world’s largest collection of living plants, Kew Gardens is also home to an incredible display of Christmas lights that will elicit plenty of ooohs and aaahs each night. Rather than just one section of the gardens being illuminated, there’s a whole path, a mile long, to explore. With twinkling lights, fairground rides and food and drink to enjoy along the trail, it’s a night out that families will remember for years to come. One of the world’s first Christmas trees was put up right here in Kew Gardens, so it only seems right to celebrate the most wonderful time of the year here too. There’s nothing more cosy than snuggling under a blanket beside a fire, with snow falling outside. There’s no white Christmas guarantee in London, but you can recreate the feeling at The Goring Hotel’s pop-up St. Moritz Ski Bar. Oozing alpine glamour, the outdoor bar is tucked on The Goring’s terrace, with heaters and blankets aplenty to keep guests cosy. Sip festive cocktails served by waiters in vintage Christmas jumpers and nibble on ski themed canapés like mini tartiflette bites, while the gramophone plays tunes from bygone eras. It’s romantic, stylish and the perfect spot for a memorable Christmas date. London has some epic Christmas trees to admire. From the biggest hand-picked tree in the city, located in Covent Garden, to a tree made entirely of sleds in Granary Square, there’s a tree in the city to warm the heart of even the biggest grinch. The best trees to see in 2015 include the St. Pancras tree made from plush Disney characters, the 20 metre-tall, 50 year-old tree sent all the way from Norway to Trafalgar Square and the surgical equipment-adorned Damien Hirst tree outside The Connaught Hotel. There are plenty of others dotted around the city, too – you don’t have to look far to find another beautifully decorated tree to get you in the Christmas spirit. Just like Christmas trees, outdoor skating rinks are everywhere in London. It’s a rite of Christmas passage for locals, to wobble along the ice, imagining yourself to be dainty and graceful while actually taking out a few innocent bystanders on your way around. After an unsuccessful lap or two, it’s customary to complain about sore feet and almost being taken out on the ice over a steaming hot mulled wine or hot chocolate. The best places to try this tradition include Eye Skate beside the London Eye, Hampton Court Palace, Natural History Museum, Somerset House and the Tower of London. 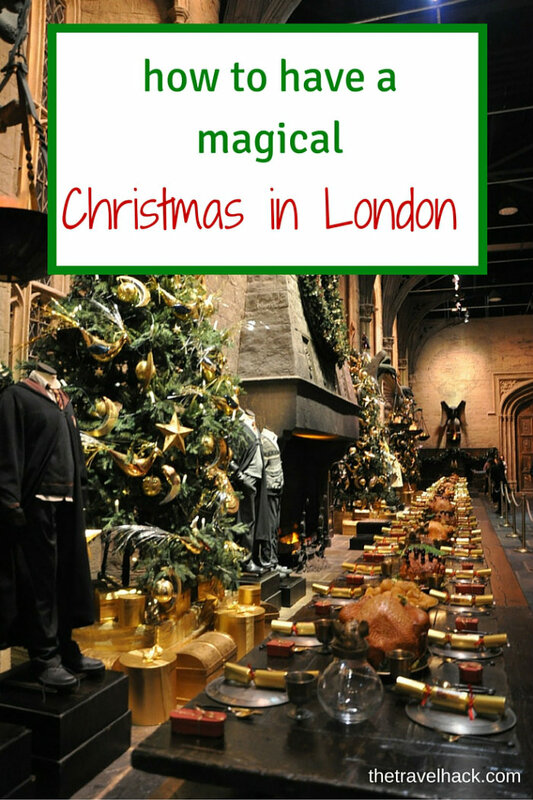 What else would you recommend to make sure you have a magical Christmas in London? Ive been this year at kew gardens Christmas lights and loved it! The winter wonderland is absolutely crowded over the weekends and i prefer the south bank stalls. Love the idea of the tree trail. Winter Wonderland can be intense – especially in the evening. Last year I went a few days after it opened in November and it was perfect. London is truly wonderful at Christmas time. There are almost too many things going on to squeeze everything in! I’m braving Winter Wonderland on Friday- the ice rink there is definitely my favourite. Wonderful Christmas in London! Happy Christmas to all! Cheers…..